Pet Friendly Self Catering cottages which are located in the Lake District National Park in a superb rural location only 15 minutes from Lake Windermere. Set in over an acre of landscaped gardens including pond, stream, arboretum and tennis court. As Guests of the Self Catering Lake District Holiday Cottages you are welcome to spend time exploring and relaxing in parts of the garden where seating is available. The fells of the Lake District are immediately accessible from our own bridle path. Self Catering Cottages in The Lake District with careful thought for your holiday comfort and to take advantage of the beautiful garden, which is an ongoing project. Click to view details of The Old Grain Store , The Old Shippon,The Twitcher's Cottage, Shepherd's View or the Garden. 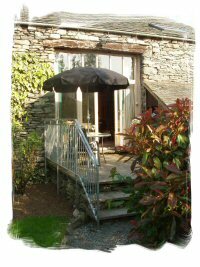 Mirefoot Lake District Holiday Cottages and Self Catering Cottages are bookable throughout the year. In the Summer we take bookings for whole weeks from Friday to Friday (Book Here). These availability pages are automatically updated so you can be sure of current information. In the Winter we take short term bookings as well. The Self Catering Cottages are available from Friday to Monday for a three night weekend or from Monday to Friday for a four night weekday booking (Book Here). Our availability pages are automatically updated so you can be sure of current information. If you want Lake District Holiday Cottages at any time of year, please email us witht he dates you are interested in. If, during the summer, a week is still available with less than two weeks to go, then we might also accept short term Self Catering holidays during the summer. Please check our availability pages to see what types of bookings are available at the moment. The Self Catering booking pages are automatically updated on a daily basis.